FLINT, MI — Chase Williams had no idea that his enrollment in a YouthQuest after-school program would lead to his artwork used for this year's Christmas card for the Food Bank of Eastern Michigan. The card is a personal touch for the Food Bank, which is in the midst of its holiday season fundraising campaign. Envelopes for donors have been included with print editions of The Flint Journal in recent weeks. The Food Bank aims to raise $925,000 for the nearly 30,000-40,000 people it serves each week. Williams, a 12-year-old sixth-grade student at Carman-Ainsworth Middle School, said he didn't want to copy someone else's art, so he thought long and hard about what he would draw. Williams combined candy canes, trees, and deer into a Christmas-themed image. “You can make any art into anything you want,” Williams said. He said when someone forces him to draw something exactly to specifications or to copy something, he doesn't like the result because he always has a vision for what he is trying to accomplish. Williams said he hopes to be a horror author one day since he is already composing stories right now. That is in addition to being an artist. Williams said he loves the Goosebumps series and Diary of a Wimpy Kid book series the best, because he thinks they are well-written. He cites the Goosebumps book “Deep Trouble” as his favorite of the series. Williams admitted he wouldn't mind combining his talents into something like graphic literature or comic books. He said he is inspired by his friends and family, and hopes to find more art contests to enter his work in eventually. “I didn't know I would win,” Williams said. He said when he received the award with his name on it, he was shocked. 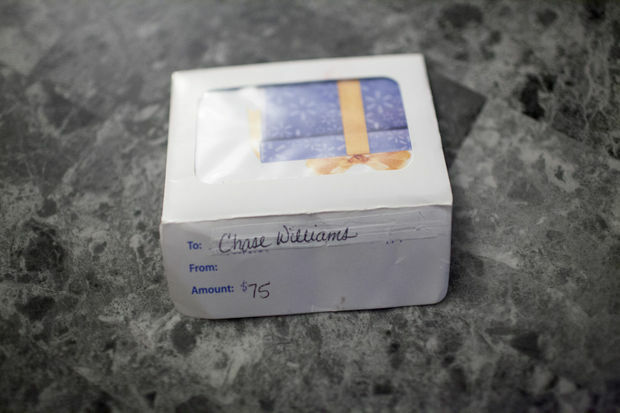 His mother Helen Boaz, a sterile processing technician at Hurley Medical Center, said that he received a small award with his name on it and a $75 gift card to Walmart. 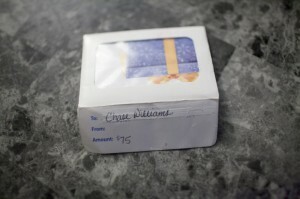 Williams said he spent his gift card on Assassins Creed III and Assassins Creed IV: Black Flag for his video game systems. Boaz admits she doesn't know where her son's artistic career will go and that she was initially shocked he won, but she is happy for him. “He just does it for fun,” Boaz said about her son's artistic interest. She said her daughter and son also participate in artistic endeavors as well, so it runs in the family. Since learning about the Food Bank and what it does, Williams said he plans to get involved soon with everything it is doing. For more information on the Food Bank of Eastern Michigan and how to donate ior volunteer, go to fbem.org or call (810)-239-4441.